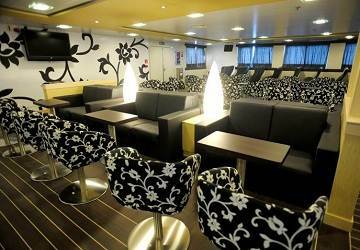 Onboard Ciudad de Málaga you’ll find cabin accommodation, tourist class seats, a bar-cafeteria, a self-service restaurant, public phone, pet kennels and a shop. There’s an a la carte restaurant, a self-service restaurant with a wide range of dishes and a daily menu to choose from. 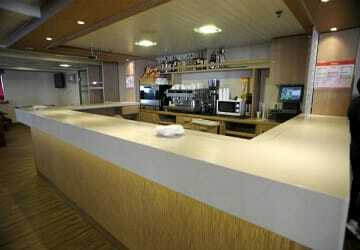 Delicious coffee and refreshing drinks are on offer at the ship’s bar-cafeteria. You’ll also find dispenser machines for snacks and sweets that you may use at any time during the crossing. Visit the Ciudad de Malaga's onboard self-service duty free shop for a selection of books, magazines, sweets, confectionery, toys and gifts. Please Note: Whilst we have taken great care in making our Ciudad de Malaga guide as accurate as possible, onboard facilities, services and entertainment may vary depending on the date and time of year that you travel, facilities mentioned may change without notification and ferry companies reserve the right to operate vessels other than those mentioned at time of booking without prior notification. Ship was due to depart at 17.00. It didn't arrive until 17.25 and by the time it unloaded and reloaded with us and all the trucks with and without the tractor units we set sail at 18.40 the trip and the unloading went OK. The crossing was perfect and almost on time. The boat was clean and the staff competent. The first boat was an hour late and the return was cancelled with no prior notice. 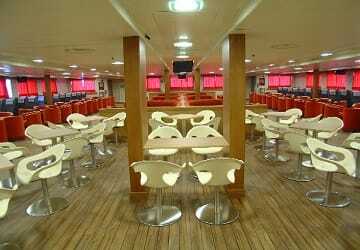 There was very little food on the voyage and what there was was poor quality and very expensive. "Algercias, Spain to Tangier Med Morocco"
It was a nice round trip ride, very affordable. Everything was easy and handled well. 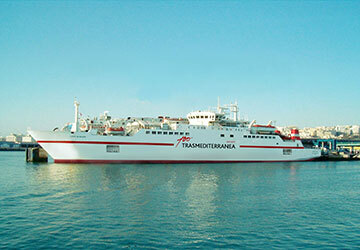 Our Tansmediterranea ferry left late and arrived even later. Boat quality adequate. Signs to the ferry were poor in Algeciras. We arrived one hour before and were the first there - though we were advised the check-in time was over an hour. They secured our motorcycles well on the ferry which was clean. The ship left an hour late. "will think again next time.."
The ship was fantastic, a little late getting off but got me there safely and I was happy with the service! 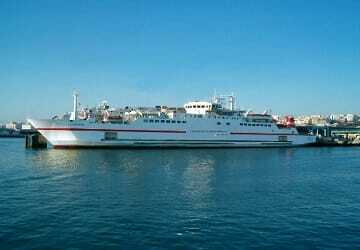 The ONLY thing I will think about again is departing from Tangier MED! I booked this ticket first assuming Tangier MED was in Tangier! It's not! its a 200Dh 45 minute taxi ride away, and with making my booking early it was a bit hit and miss i would arrive on time. When I returned to Morocco I did it a bit different, took a fast ship from Calcutta directly to Tangier and a 5 minute taxi from Tangier port to the train station/city. I was staying in Algeciras however 1hr before your departure from Calcutta there is a free shuttle bus from outside the Algeciras terminal (20 minutes but nice and air conditioned) takes you to Calcutta terminal then a fast boat to Tangier :) Also if you are doing it the other way around go to Tangier get the boat to Calcutta and the free shuttle bus will take you to Algeciras. A good experience A serious company, a nice reception and a good information. I would recommend it. Last month we travelled to Morocco with Transmediterranea and I must say there is no compliance with the schedule at all. We departed with an hour delay and we arrived two and a half hours late. Other than that, everything was correct. A hassle free and smooth trip from Morocco to Spain. We did however go to the wrong port, and did not realise the port was so far out of Tangier, ensure you leave plenty of time to get to the ferry. The ferry does not accept Dirham, so ensure you spend up before getting on the ship, and take Euro with you if you want a coffee. Definitely recommend this company. 2 hour delay and the ferry needs renovating. "Trasmediterranea Ferry to Tangier Med "
First - the ferry goes to Tangier Med which is about a 1-hour bus ride from Tangier. The bus costs about 3 euros. We got a cab ride back for 20 euros (4 people). The bus dumps you off in the middle of the city where you will be accosted by people trying to show you around - for a fee. DirectFerries said the trip would be 30 minutes - it was three hours. 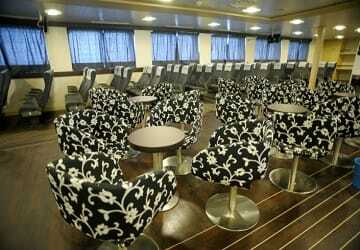 The ferry had a bad odor in the main room. The return ferry was much better and only took an hour. Overall, the ferry ride was acceptable, but I would recommend trying to find one that goes directly to Tangier. Very good crossing, will use again soon. For the price, I was impressed with the services available on the ferry. 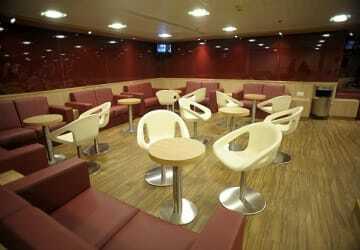 The seats were comfortable and there were reasonably priced food. However, the ferry left 2 HOURS later than the departure time indicated on the ticket. This caused my friends and me to be late for our train, which we booked with 2.5 hours between our supposed arrival time and the train departure time. This left me with the impression that the ferry company does not value its customers and is not reliable for timely transportation. I would only recommend using the ferry if you have a lot of time to spare on the travel day. In fact I would give the ship punctuality a rating of "0 stars" if I could. Avoid this one if you're in a hurry. We were delayed by 2 hours in each direction.